Golf getaways are all about relaxation with just a touch of excitement. Imagine golfing among some of the most stunning views in the state, then dining at a gourmet restaurant. After a fun evening, tuck in and sleep soundly at the on-site resort. These five destinations offer amazing golf courses, luxury accommodations and even more exciting attractions for the full golf resort experience. VisitIndianaGolf.com is the place to plan your golf getaway. Golfers flock to this club for sessions with PGA Professionals, tee times at the two courses and discount weekday packages. Swan Lake Resort offers accommodations of all kinds, including rooms, suites, cottages, cabins and villas. Enjoy both bar and table dining in an elegant restaurant with views of the course. Sports enthusiasts will love kicking back at Putter’s Bar & Grille with billiards, TVs and beer on tap. Book your stay. Designed by legend Tom Fazio, this championship course winds through lakes, trees and bunkers. The beautiful rolling hills of southern Indiana make it a favorite among golfers. After a round, hit the casino for table games, slots, poker and more. The casino resort also features five delicious restaurants, nightlife, entertainment and a spa. After a day of excitement, relax in one of the plush guest rooms. Book your stay. The area is known for its gorgeous rolling hills and lakefront views. This championship course was designed by world-renown architect, P.B. Dye, son of Pete and Alice Dye. Three sets of forward tees challenge a wide range of player skill levels. While staying at Sagamore Resort, grab a bite at Ainsley’s Café & Harbor Bar and rent a pontoon boat for a sunset cruise on Brookville Lake. Book a stay. 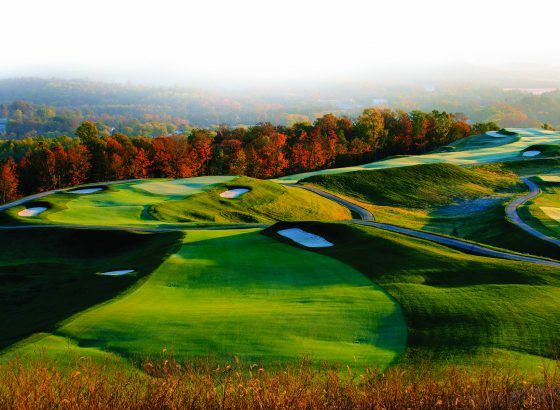 This resort is home to three of Indiana’s most revered courses: The Valley Links Course, Donald Ross Course and The Pete Dye Course at French Lick. Golf enthusiasts rave about the stunning views, challenging courses and superb designs. With many options to choose from, golfers can pick their perfect experience. Select your courses and resort hotel, then up the ante with private lessons, other recreation activities and more. French Lick Resort also boasts fine dining, spas, gaming and multiple swimming pools. Book your stay. Rookies and experts alike can’t help but relax among the picturesque scenery and nature that Southern Indiana’s Brown County is known for. The course winds through rolling hills and ravines, crossing Salt Creek seven times. The condominium-style hotel guarantees a comfortable and spacious stay with all the luxuries of home. While at the upscale rustic resort, kick back at the sports bar, unwind in the hot tub and enjoy the outdoor pool. Book your stay. No matter what your dream getaway is, enjoy it with your favorite golfers in Indiana. Find more stay and play experiences at VisitIndianaGolf.com.